Are you looking for a reliable plumbing company serving Maryland, Virginia, or Washington, DC? Call R.V. Carey’s! Since 1988, R.V. Carey’s has been providing top-of-the-line plumbing services with an unparalleled commitment to honesty and customer satisfaction. R.V. Carey’s offers top-of-the-line plumbing services to families throughout Maryland, Virginia, and Washington, DC. Check out our list of plumbing services below, or give us a call today to speak with one of our knowledgeable staff members! Clogged drains? Leaky faucets? Don’t wait—call us today at 301-424-8899 or schedule service online! R.V. Carey’s is a locally owned and operated plumbing company headquartered in Rockville, Maryland. Our licensed plumbers provide expert residential and commercial plumbing repair and replacement services throughout Maryland, Virginia, and Washington, D.C.
Clogged drains are some of the most common plumbing issues faced by homeowners every day. And while quick-fix solutions like chemical drain cleaners may work in the short term, the best way to eliminate clogged drains for good is to stop them at the source. For that, you’ll need to call a plumber! If you have a clogged sink, shower, or toilet or if you suspect your main sewer line is clogged, don’t wait—call R.V. Carey’s! From repair and replacement to installation and ongoing maintenance, R.V. Carey’s has your water heater needs covered! We can service any make and model of water heater, whether it’s gas, electric, or tankless. Call today for water heater services in Maryland, Virginia, or Washington, DC! Your toilets, showers, and faucets are some of the most important fixtures in your home. So if they’re not working properly, you need to have them fixed right away! R.V. Carey’s provides fast, friendly, reliable toilet, shower, and faucet repair services throughout Maryland, Virginia, and Washington, DC. 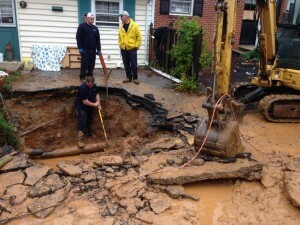 A leaky pipe can do major damage to your home. R.V. Carey’s provides a number of pipe repair services, including leak detection, sewer line repair, polybutylene pipe replacement, and more. Call us today! No matter what your plumbing service needs in Maryland, Virginia, or Washington, DC, call R.V. Carey’s today! What Sets R.V. Carey’s Apart from Other DC-Area Plumbers? When you call for a plumber, you’re looking for more than just plumbing–you want the peace of mind that comes from knowing the plumber you hired is trustworthy and polite. In addition to being background checked and drug tested, all of the technicians at R.V. Carey’s are friendly and courteous and can answer any questions you have regarding your plumbing system. We charge based on time and materials. Why? First, no two plumbing jobs are the same. Even a seemingly simple leak repair can vastly differ from another leak repair! Since a job may take longer for one person than another, a flat fee may lead you to overpay for your service. Next, we feel we can provide a better service by encouraging our technicians to work carefully instead of rushing between jobs. By charging time and materials, we’re able to ensure that you get the highest quality of service possible while still sticking to your budget. All plumbers undergo continuous training and education so they can give our customers expert service, advice, and support. Our level of experience ensures our ability to complete a job in a timely manner, thus saving the customer money. We offer a senior citizens discount. Our servicemen average over 15 years’ experience. We are able to provide additional plumbing support through the use of camera, jet machine, and backhoe equipment. We provide 24-hour, 7-day-a-week support through emergency on-call service. 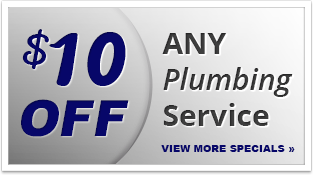 For all your plumbing needs in Maryland, Virginia, or Washington, DC, call 301-424-8899 or click here! We desire to provide total customer satisfaction by establishing positive working relationships with each customer through organization, high quality, a professional attitude, and guaranteed workmanship, and maintaining that relationship by encouraging customer participation in design, arriving on time, keeping the customer informed, staying on budget and on schedule, and by having honesty, openness, and integrity with every customer we have. We are proud to serve the MD, VA and D.C. areas.